Murano is a cluster of five small, closely spaced islands in the Venetian lagoon, less than 2 miles (about 3km) north of the city of Venice, Italy. 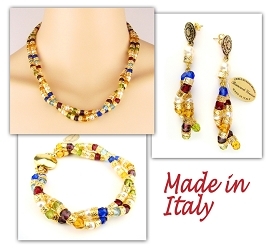 It is believed that distinctive Venetian style of Murano jewelry originated in the 9th century when Venetian Republic became a major international trading port. 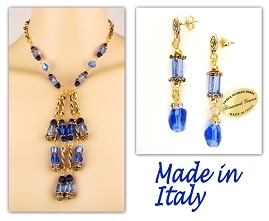 Venice's trade with Far Eastern and Middle Eastern countries at that time brought new concepts, and later, Venice got direct knowledge of "enameled" glass from Syrian origins when the artisans arrived from the Middle East, after the Fall of Damascus in 1400… Today, centuries later, artisans of Murano are still creating beautiful traditional and contemporary world-renowned original jewelry items using unique Murano glass as one of the main materials for their artistic expression. 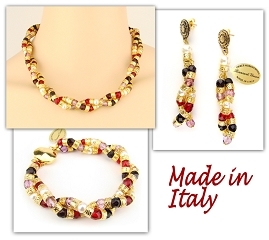 This new collection of the original Italian fashion jewelry is designed and produced by Beancardi in Venice, Italy. 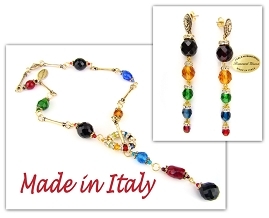 All jewelry items presented in this collection combine today's technological research with creativity and traditional, centuries old distinctive Venetian art of glass and jewelry making.